Greek sprinter Katerina Thanou has been excluded from the Beijing Games after the International Olympic Committee refused to accredit her. 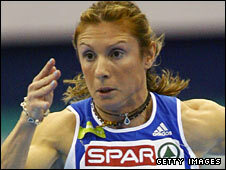 Thanou, 33, had been named in Greece's Olympic squad for the 100m. The IOC has blocked her participation because of her controversial withdrawal from the 2004 Games in Athens. An IOC spokesperson said the decision was meant "to send a firm signal... that this case has brought the Olympic movement very much into disrepute". Thanou had threatened to sue the IOC and president Jacques Rogge if she was not allowed to compete in Beijing. The sprinter and compatriot Kostas Kenteris each missed a drugs test on the eve of the 2004 Games. It was the third time they had missed a test, resulting in a two-year suspension from competition. The pair claimed they had been involved in a motorcycle accident on their way to the Olympic Village in Athens to be drugs tested. They still face criminal charges of perjury and falsifying evidence in Greece relating to the accident. The IOC argued it had the right to exclude Thanou after she surrendered her accreditation at the Athens Olympics. A disciplinary commission had been set up in Athens to investigate the circumstances of the athletes' withdrawal. Thanou and Kenteris turned up to simply surrender their Olympic accreditation, which meant the IOC no longer had jurisdiction over the case. However, the IOC did decide "that any participation of Kenteris and Thanou... at any further edition of the Olympic Games shall be subject to a new procedure in front of the IOC". Rogge said last month: "When Thanou handed over her accreditation, she was no more an Olympic athlete. "We said at the time that we would review the eligibility of Thanou for Beijing. So if the Greek Olympic Committee enters Thanou in Beijing, we will study the eligibility. We have the right to do that." Thanou's lawyer, Gregory Ioannidis, told the BBC that the IOC's decision was based on "lack of legal arguments and the discrimination". And the athlete is likely to continue to be a thorn in the side of the IOC. She has threatened to take legal action if she is not handed Marion Jones' 100m gold from the 2000 Sydney Olympics. Jones was stripped of her Sydney medals after admitting she had been doping at the time and Thanou finished second in the 100m.